Mirror photo by Michael Boytim Diamond Dallas Page signs autographs for Knox Dibert, Logan Hammer and Parker Hammer. 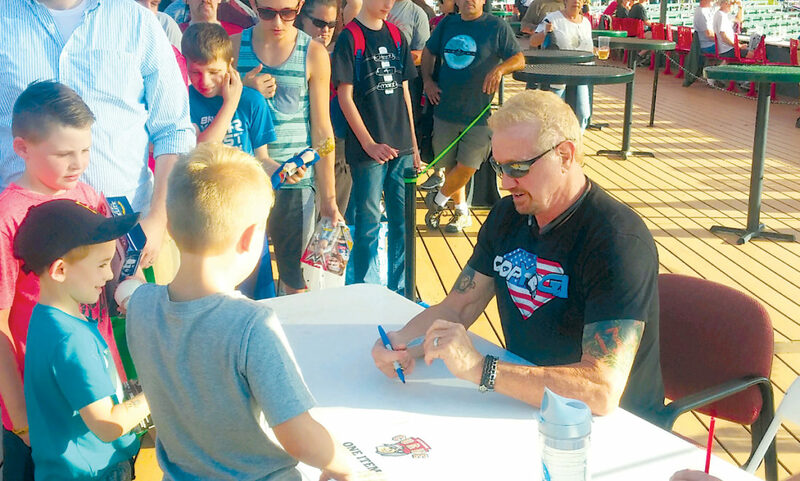 Three-time world champion and WWE Hall of Famer Diamond Dallas Page made his way into Peoples Natural Gas Field Thursday for the Curve’s game against the Harrisburg Senators, and he had a special friend with him. Hollidaysburg native and former UFC fighter Charlie Brenneman accompanied the pro wrestler, sporting a “Spaniard” T-shirt. Page is touring the country, inspiring people to reach their goals and promoting his DDP Yoga, which he now refers to as DDPY. Page spoke with both the Harrisburg and Altoona players before Thursday’s game and then gave a speech to a local group of wrestlers from Phoenix Pro Wrestling. Brenneman, who also found success on Spike TV’s “Pros vs. Joes,” lives in Harrisburg now and has been spreading his message through many platforms. That’s something that Page, now 62, has lived by since he became a late bloomer in pro wrestling and achieved the pinnacle of the sport well into his 40s. That memory ranked a close second for Page when reflecting on his career. One of the reasons Page is in the Hall of Fame is his signature finishing move, the Diamond Cutter. Current WWE wrestler, multi-time world champion Randy Orton, is known for his “out of nowhere” finisher, the RKO. The move, which has been featured in many viral online videos, is similar to the Diamond Cutter but involves Orton leaping into the air to initiate the move. Both moves can be performed in an instant and from many different positions, however, Page said neither he or Orton originated the “out of nowhere” concept. A long line of fans waited for Page Thursday on the third pro wrestling night at Peoples Natural Gas Field. Fellow WWE Hall of Famers Mick Foley and Sgt. Slaughter attended the first two events. Page has done plenty outside of the ring in addition to his appearances at ballparks. He began his acting career with the movie “First Daughter” on TBS in 1998 and followed that by starring in “Ready to Rumble” with David Arquette. He has a new show slated for Netflix with the working title “Gods and Secrets” about a dark superhero story. In January, his book, “Positively Unstoppable, the Art of Owning it,” is coming out.